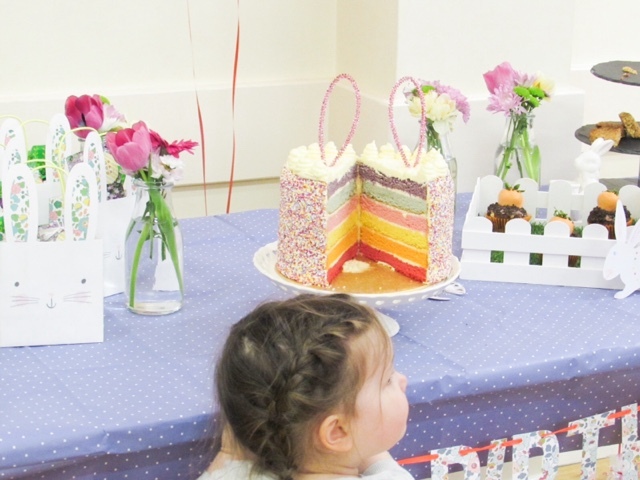 On Sunday we had Isabella's much anticipated second birthday party, with a floral bunny theme. The fact that my baby is now two is hard to believe and because it's her last birthday as an only child I really wanted to make it special. 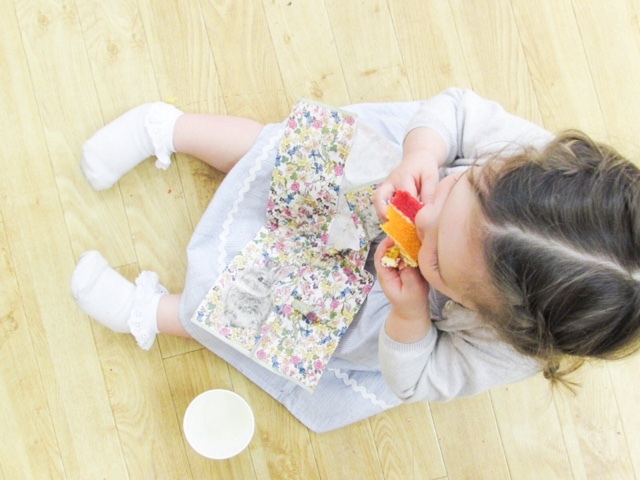 Last year we had a floral themed birthday party for first birthday (have a nosey here), which was so lovely but Isabella was too young to really understand that everyone was there for her. However, this year she knows what's going on and it made the party planning so much more exciting! 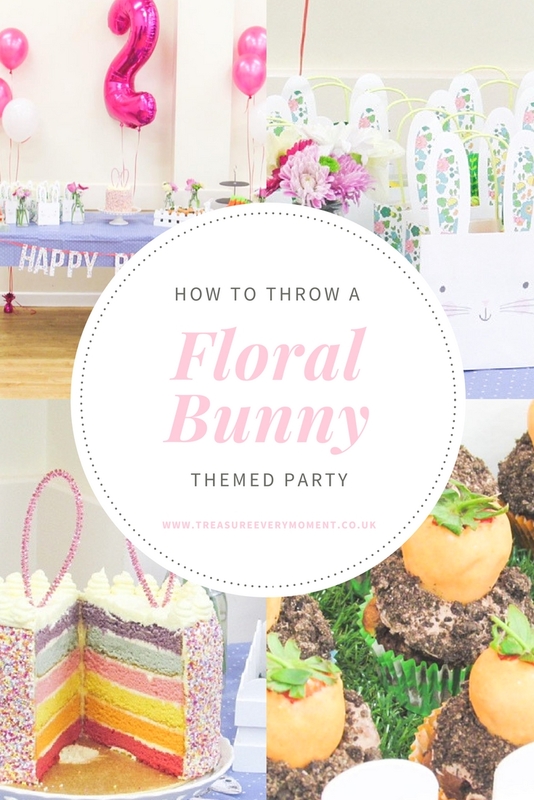 Isabella is really into rabbits at the moment and flowers felt like a must for a spring birthday, hence how we ended up having a floral bunny theme. Also, the fact that the shops are filled with Easter bunny decorations made the preparations so much easier. I put together a blog post filled with lots of Pinterest inspiration I used while planning this party, which you can read here and a tutorial for making the invitations here. Hobbycraft is the place I headed for all the craft/DIY supplies for the party - it's a one stop shop! Last year we got all of the helium balloons from a local shop, but because we hired a hall this year we didn't have time to go and pick up balloons on the day. 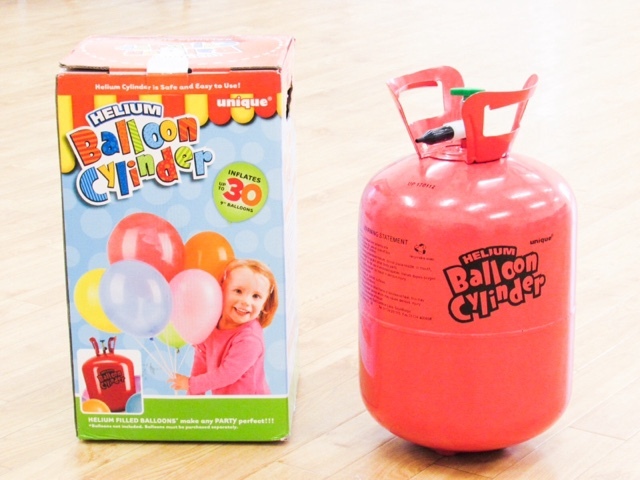 This Helium Balloon Cylinder* (£18) made life so much easier and allowed us to get exactly the balloons we wanted. Of course we had to have a giant pink 2 foil balloon* (£5), which we then paired with helium grade pink and white standard balloons. If you do get your own helium cylinder for an event then don't forget the curling ribbon* and balloon weights*, otherwise you're left with a lot of balloons on the ceiling! Using the helium canister was surprisingly easy and the giant pink 2 foil balloon self seals too, so no fiddly knotting of balloons. We did the giant 2 balloon and around 15 'normal' sized balloons and there was still helium left, so one tank is plenty for decorating most party venues. 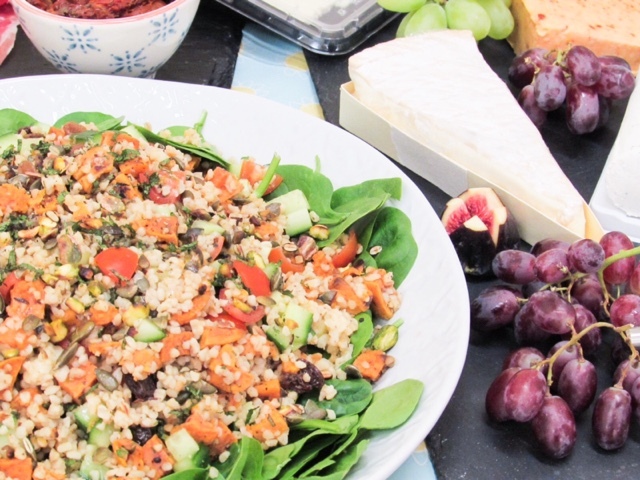 The food is always an important part of a party to me, we decided to cater for both children and adults so we had our work cut out. 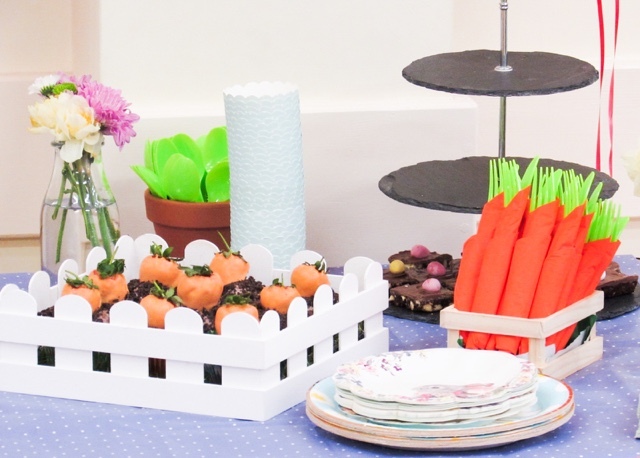 I wanted to pull the bunny theme throughout the food as and when I could, which is why this white wooden picket fence crate* lined with faux grass roll* was perfect for displaying the 'carrot' cupcakes. 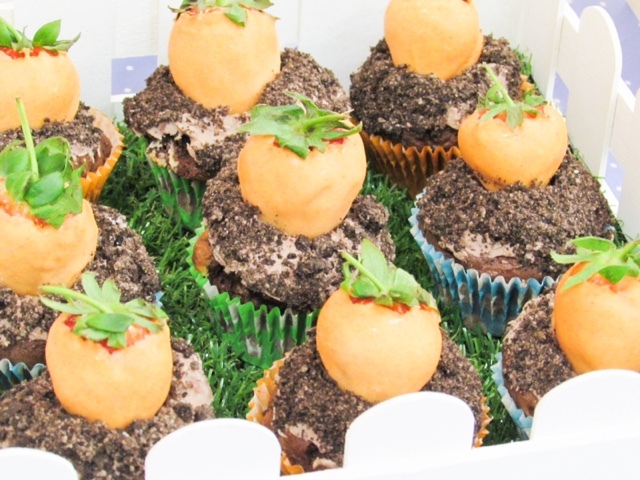 They were chocolate muffins with a hole cut out of the middle, spread with chocolate buttercream, dipped in crushed Oreos and a orange coloured chocolate covered strawberry placed in the hole as a carrot in a mud patch. Talking of carrots, I put together green disposable cutlery* and orange napkins* from Party Pieces to make these carrot inspired cutlery bundles. They're so easy to do and our guests loved the fun twist. For the party bags I knew that I wanted these ones from Meri Meri as soon as I spotted them. 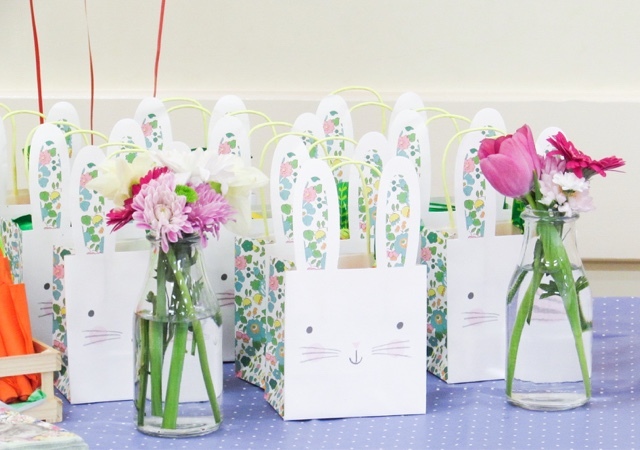 They're part of their Easter Liberty range and are just so flipping cute! I ordered them from ASOS of all places because I have their yearly next-day delivery subscription, so it was the cheapest way of buying them. Though when I came to writing this post I couldn't find them on ASOS anymore, but there are lots of other websites that stock them too. 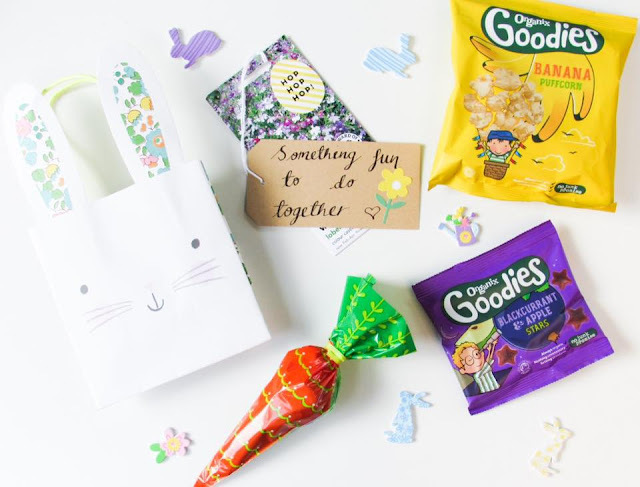 The party bags contained an Organix snack, a Wilton Easter Carrot Shaped Party Bag* filled with sequins, feathers and some spring foam stickers* and a packet of flower seeds as a fun activity to do over the summer months. 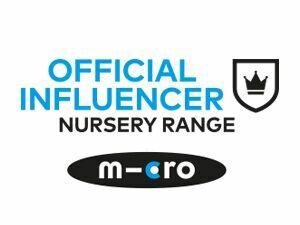 We hired a bouncy castle with a slide as the main entertainment, but I also wanted something slightly quieter for the children to do. 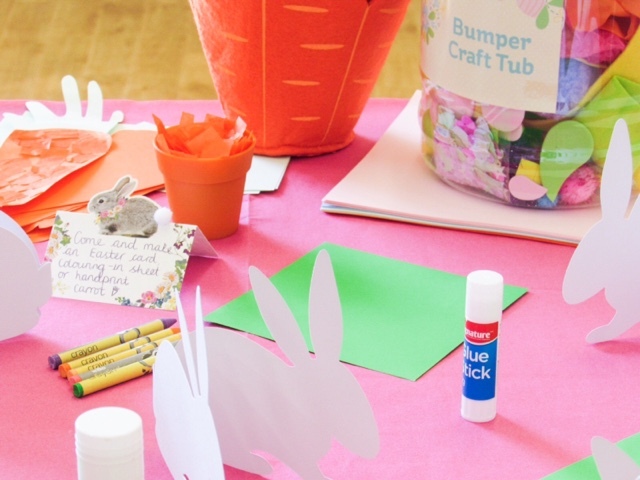 We therefore had a craft table where the children could make Easter crafts, cards and handprint carrots. 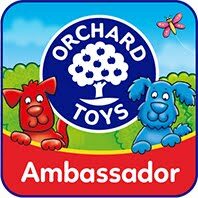 It was such an easy way of providing entertainment and was enjoyed by both children and adults alike! 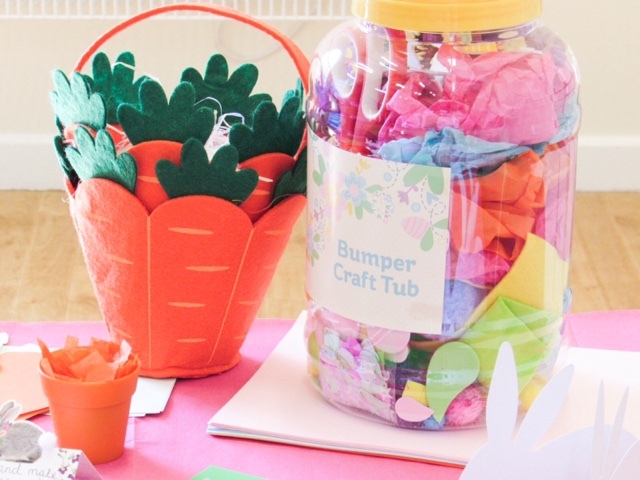 The Bumper Easter Craft Tub* from Hobbycraft made it very quick to set up the table as it was filled with glitter glue, felt tips, polystyrene eggs, pipe cleaners, shredded tissue paper, sequins etc. 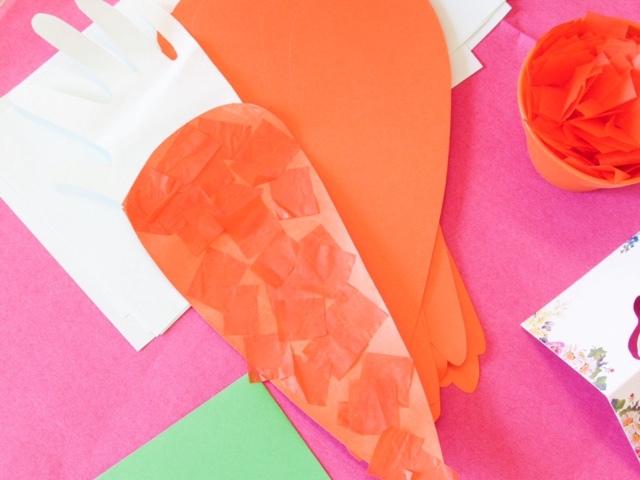 I then added some more tissue paper, a pair of scissors (kept safe inside the tub and away from toddler hands!) and some of the leftover Spring foam sticker that went into the party bags. 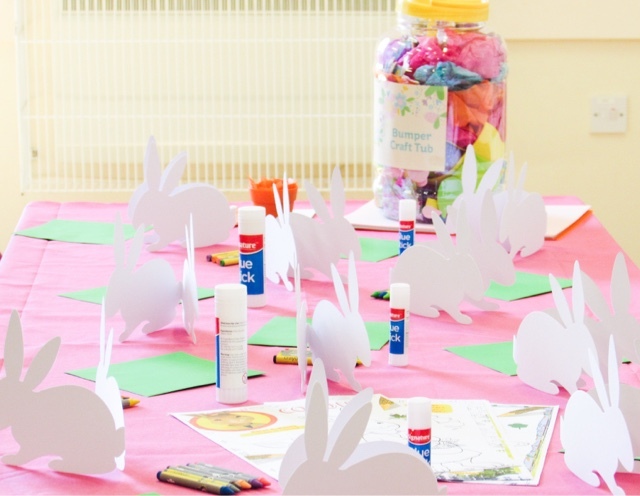 We also had these rabbit shaped blank cards with green envelopes for the children to decorate, which were £1 for a 5 pack from Tesco. Some glue sticks, rabbit colouring pages and wax crayons. The toddler's all sat down around a long table, so this was the focus on table decorations. I lay the leftover faux grass roll from the picket crate in the middle of the table, over the top of these beautiful floral disposable tablecloth from Tesco. 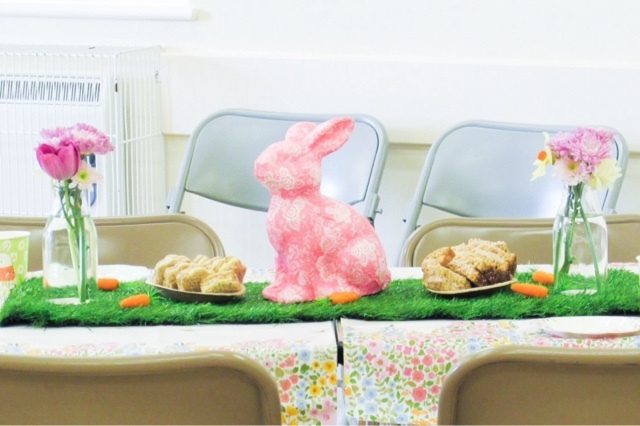 Isabella and I had worked together to glue layers of this tissue paper from Card Factory onto this adorable Hobbycraft Polystyrene Easter Bunny* (£3), which proudly sat in the middle of the table. We used lots of these glass 'milk bottles' from IKEA as vases, which I arranged a few bouquets of flowers in. 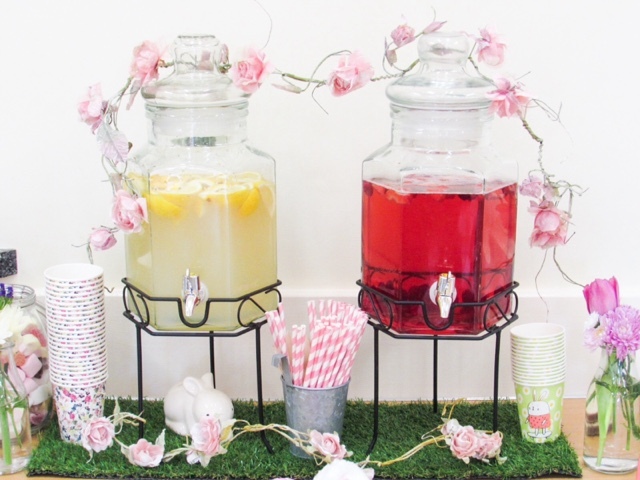 Such an affordable way of having lots of flowers dotted around the party venue. 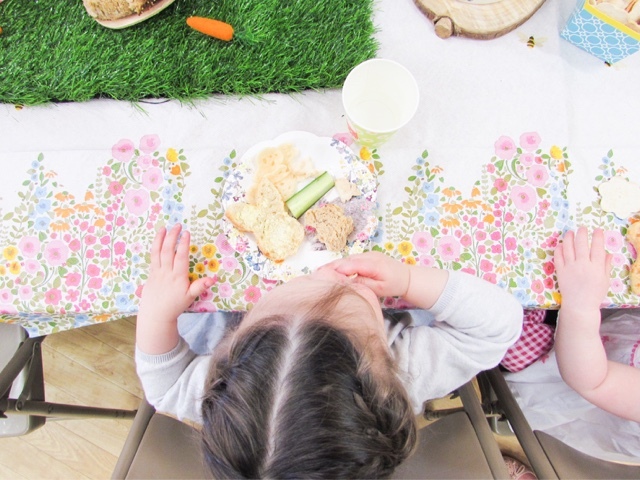 The toddler friendly food was displayed on their table, including Organix Carrot Stix, cheese sandwiches in the shape of flowers, Tesco Bunny Bites, carrot, apple & raisin cookies (recipe here), rabbit shaped cheese scones, magic wand fruit kebabs, crudité and rabbit/flower tortilla wrap 'crisps'. 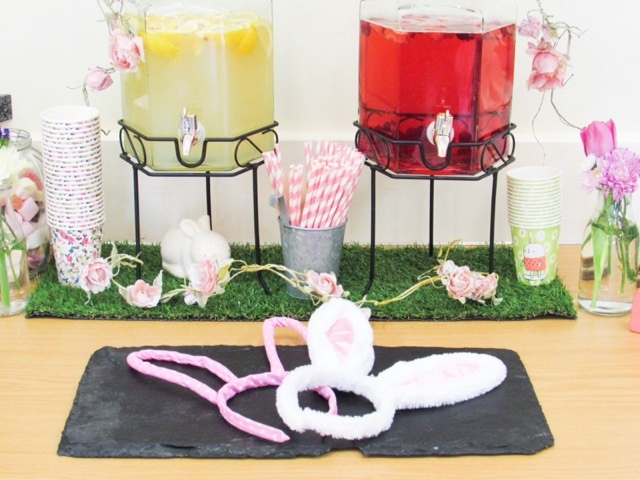 These seriously cute Truly Bunny Place Cards* from Party Pieces were dotted around labelling foods that weren't as obvious as to what they were. We also had the matching Truly Bunny disposable plates*, cups* and napkins* for birthday cake. 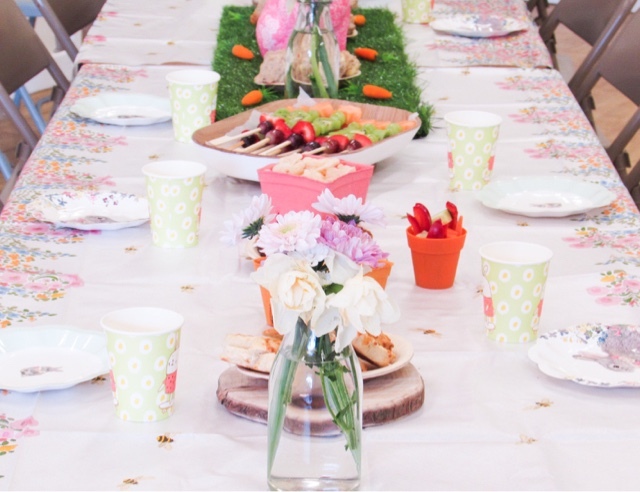 Our guests absolutely loved how cute the design is, with many not wanting to throw their plate/cup away at the end of the party! 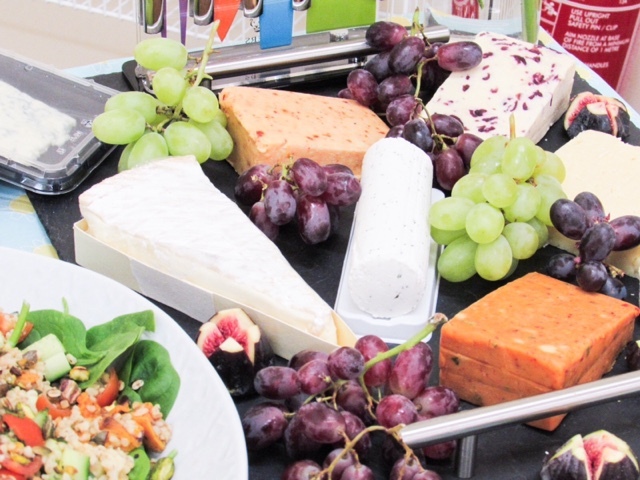 The adult's food was themed around antipasti, so there were lots of different types of bread, meat, cheeses, salads, dips, crudité, breadsticks, crackers, grapes, figs, nuts etc. 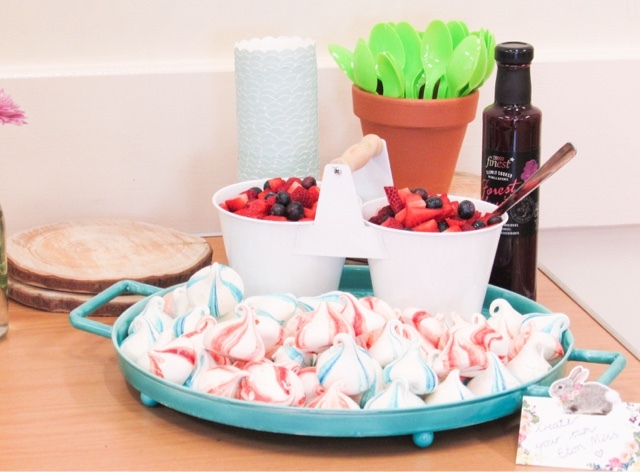 Dessert was an Eton Mess station with homemade meringue kisses, whipped cream, lots of fresh berries and a fruit coulis. 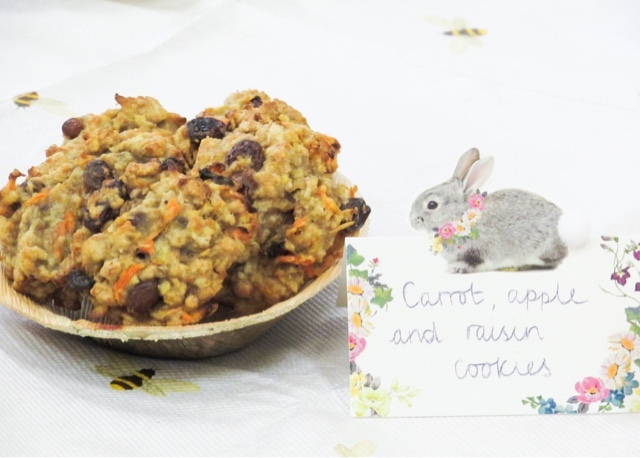 We also had flapjack, rocky road, chocolate 'carrot' muffins and of course birthday cake. 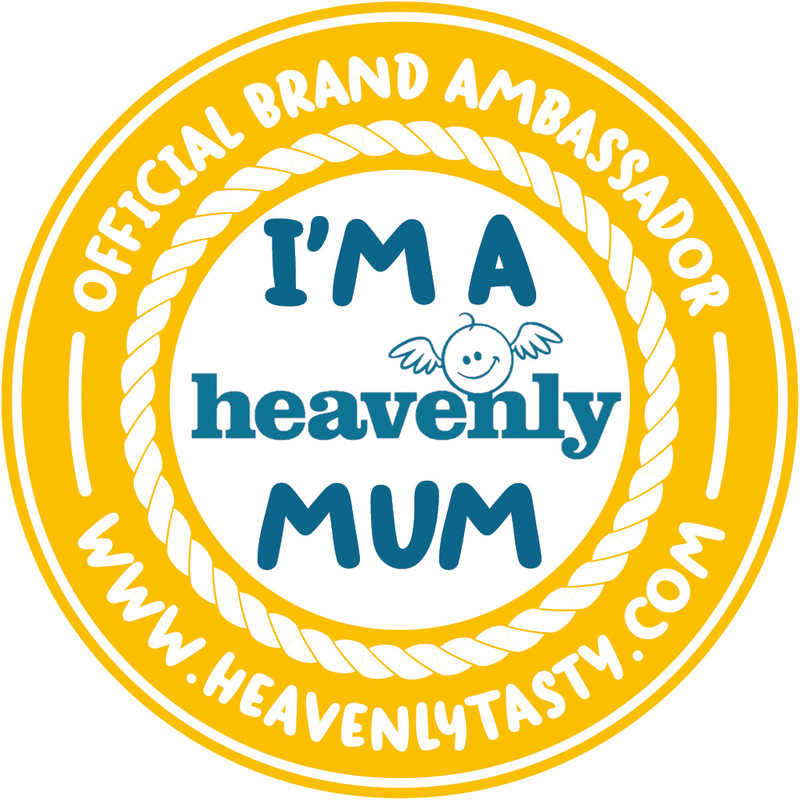 We tried to keep the homemade aspects to a minimum, as I'm heavily pregnant and time was limited. However, there ended up being a fair amount to make/prepare/cook/bake on the few days prior to the party. My ankles were so swollen come the day of the party, after being on my feet for so many hours! Isabella's birthday rainbow cake was ordered from Marks and Spencer (with a £5 off voucher I was sent via my Sparks card when it was my birthday - bonus!). We organised for it to be collected the day before the party and luckily it came really well packaged making transporting it around really easy. To make it fit with the bunny theme I then added some pink sparkly pipe cleaners from Hobbycraft in the shape of bunny ears. 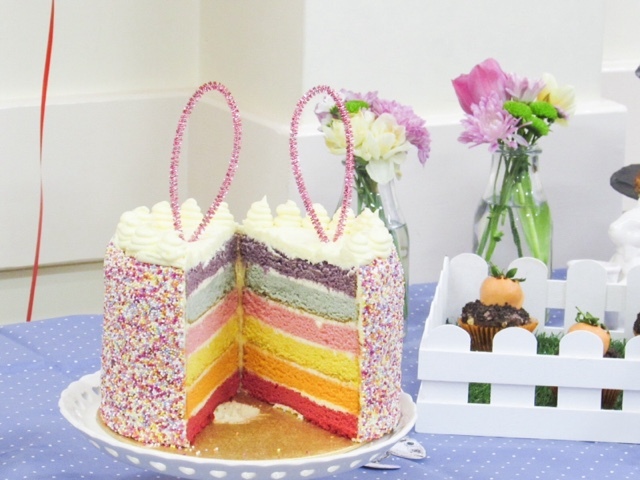 It is such an affordable, easy and quick way of transforming any cake. 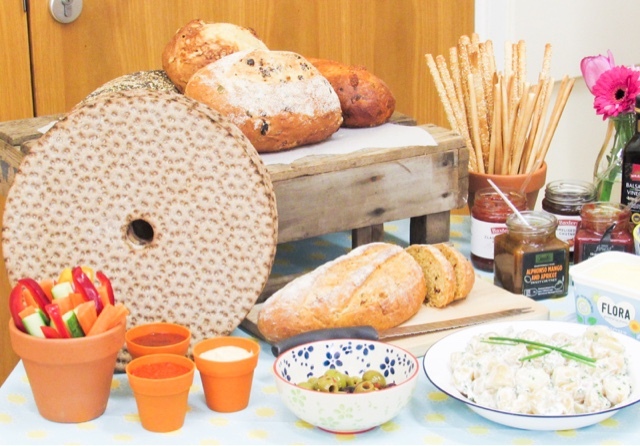 The blue spotty disposable table cloth on the cake table was from Tesco and a bargain at £3.50. 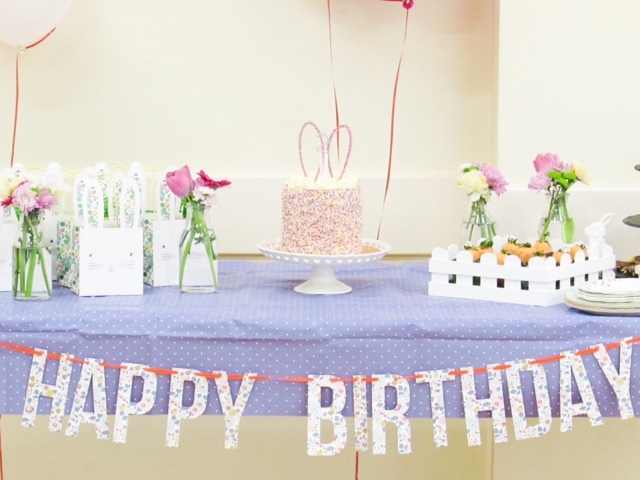 We had this Happy Birthday Liberty Betsy garland for Isabella's party last year, such a good one to keep bringing out year on year and it was from Party Pieces. Love this! 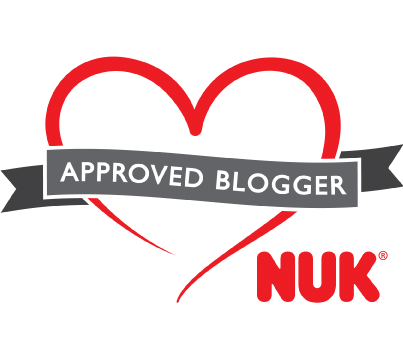 I've been waiting to see this party since you mentioned what you were doing on #littleloves. 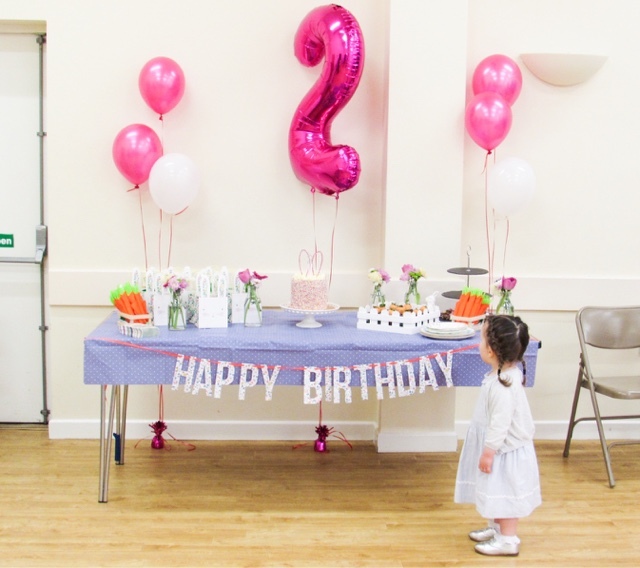 What a fantastic theme to have for a birthday, oh to be 2 again! I just love all the bunnies but my real favourite is the forks wrapped in napkins and they look like carrots. Just so clever. Wow! 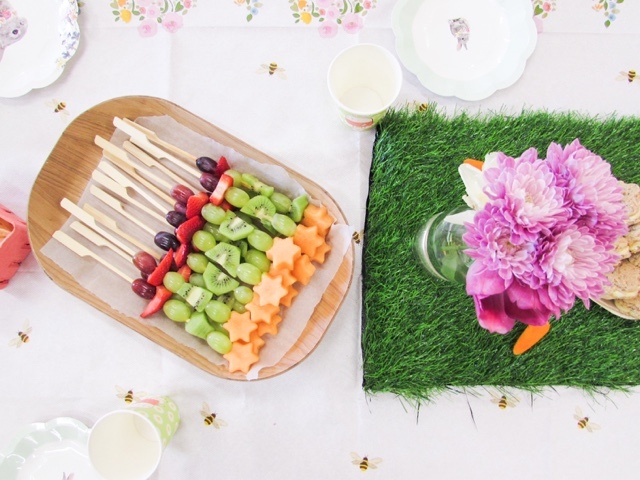 A Pinterest Perfect party if I ever did see one! Well done you. So creative. First of all Happy Birthday Isabella. 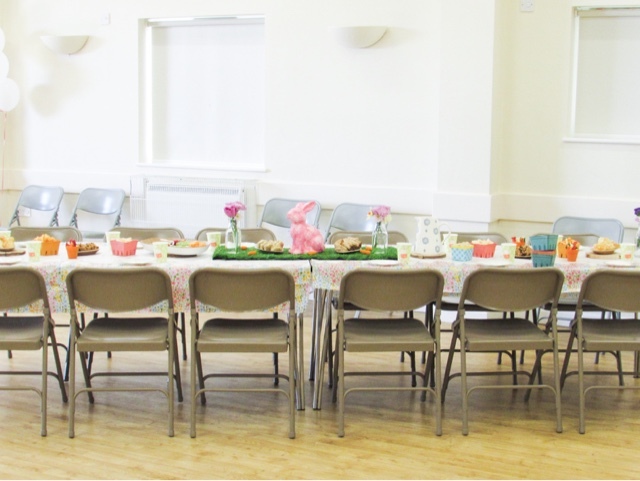 Secondly what a darling party, all well thought out and planned to completion. 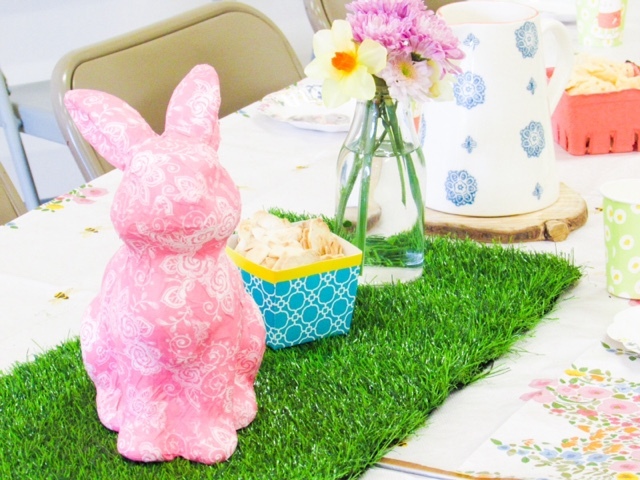 I love Party box they have wonderiful decorations, we also recently had an Easter Egg hunt and their pieces are absolutely stunning. Well done on putting on a fab party. wow you did such an amazing job!!! I'm thinking of doing a floral theme for maddies 2nd birthday. You have inspired me to start planning! Amazing party. I have just over a week to sort my eldests 4th birthday party but it's only a small family one. Love the food you did. wow this looks like something out of a glossy mag. love it!